Never in this world was a city so dependent on a monument to establish its identity. Never was a monument so beautiful as this. Taj Mahal signifies Agra and vice versa. Agra, the imperial capital of erstwhile Mughal Empire, is the city of unspeakable grandeurs. Taj Mahal is not only the most beautiful monument in Agra but also probably in the whole world. The sheer look on this white beauty provides solace to heart and soul. Taj, the most magnificent symbol of love that a man ever built for a woman, stands almost in the center of the city of Agra. Dominating walls, an intimidating gate, a mosque and a royal inn enclose the structure. Agra Fort is another magnificent construction in the city. The fort encloses some of the most beautiful buildings in India that includes Shish Mahal, Divan-e-Aam and Divan-e-Khas among others. Itmad-ud-daula tomb near the banks of Yamuna is worth visiting too. This is the first tomb that was fully carved out of marble. Chini ka Rauza has its place in the architecture of India. The tomb dedicated to Mir Afzal Khan was the first building in India to be decorated exclusively by the glazed tiles. Other important attractions include Mehtab Bagh and other smaller Bagh. The excursions around Agra are no less interesting than the city itself. 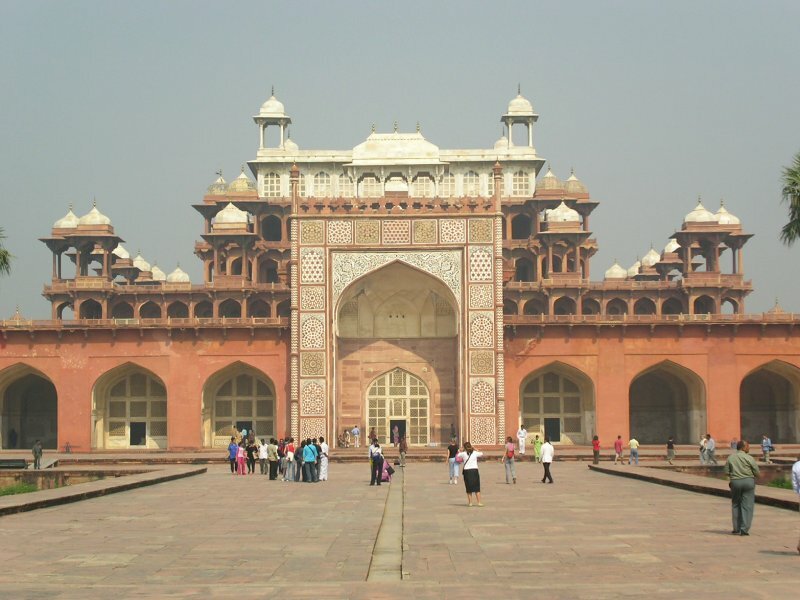 Fatehpur Sikri, the capital of Emperor Akbar has some of the most beautiful monuments. Buland Darwaza, Salim Chisti Tomb and Panch Mahal are to name a few. Sikandra, the resting place of Akbar attracts due to its fusion architecture. Agra is a shoppers delight. The place is famous for its marble works and Zardozi. Do buy a few souvenirs for your dear ones. A miniature replica of Taj Mahal is a must buy. You can also spoil your taste buds by tasting sweets like Gazak and Pethas.